Willis Creek is one of the great Wonders of our area - Skutumpah Road that leads into the slot canyon is so close! 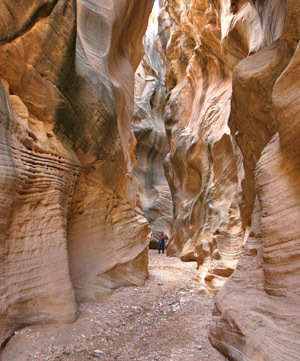 It is one of those beautiful Slot Canyons that will just mesmerize you as you hike through it. This picture just doesn't do it justice. 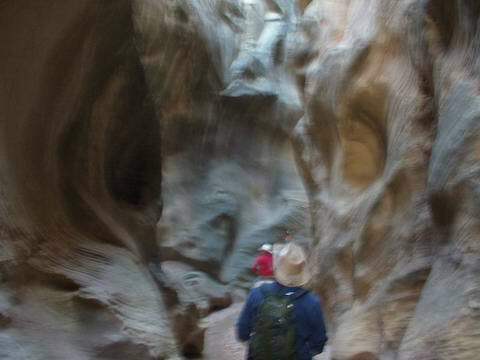 As you will see with the various pictures we show you, it is a massive slot canyon with so many different colors. Depending on the time of day will even determine the colors you'll see. 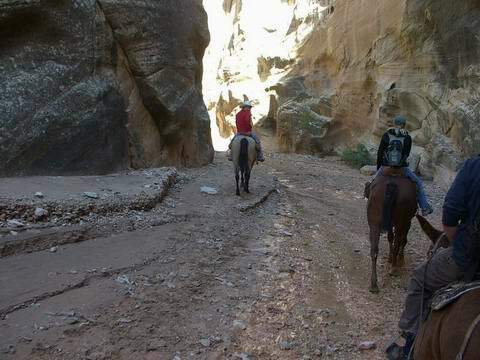 Because it is so tall and winding, it is best to hike or horseback into Willis Creek during the mid-day sun. 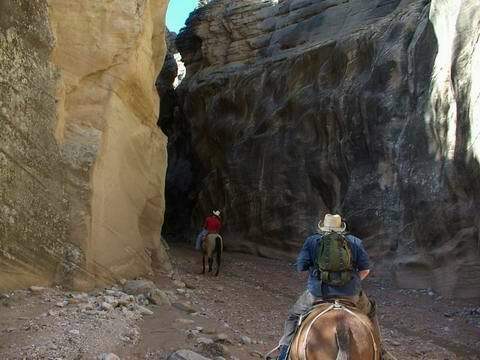 Best of all, the road that leads to Willis Creek Slot Canyon is just a block away from our cabins! Skutumpah Road is the entrance road to where the canyon is located. Many of our guests will either ride horses through there, or just drive into the easy entrance parking area and just hike it. If you want to enjoy a great horseback ride, we suggest contacting Mecham Outfitters in Tropic for your horseback ride. They will typically take guests into the canyon on a guided tour either in the morning or afternoon - depending on the time of year. Hiking it is very enjoyable. Between Cannonville and the entrance to Kodachrome State Park, is the entrance road to the canyons. Just a little less than 3 miles from the town of Cannonville will be Skutumpah Road, on your right. Follow this dirt road about 6 miles until you come to a small parking lot. Just park your car and walk into the river bed. It will always have water in it because it is spring fed. Just follow the stream only about a mile and you'll come to the Willis Creek Slot Canyon. You will pass several very wide cliffs on the way - those are not it! You WILL know when you get there. It is a colorful, windy, curvaceous slot canyon. Take lots of pictures - it will be incredible. These pictures are from a guest that was riding a horse into the canyons so they aren't quite as focused for you. If you get some great pictures, we would love to replace these! Always ask before going there! Even a little bit of rain can have a serious effect on how dangerous it is. The Canyon gets VERY NARROW! Water rushes in and fills it very quickly!